Lalbagh Flower is a sight to watch. 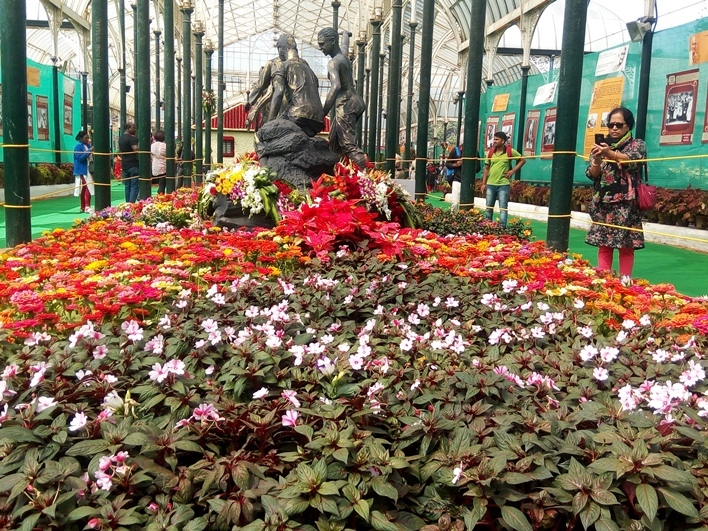 Every year on Independence Day and Republic day, flower shows are organized at the Lalbagh Botanical Garden. 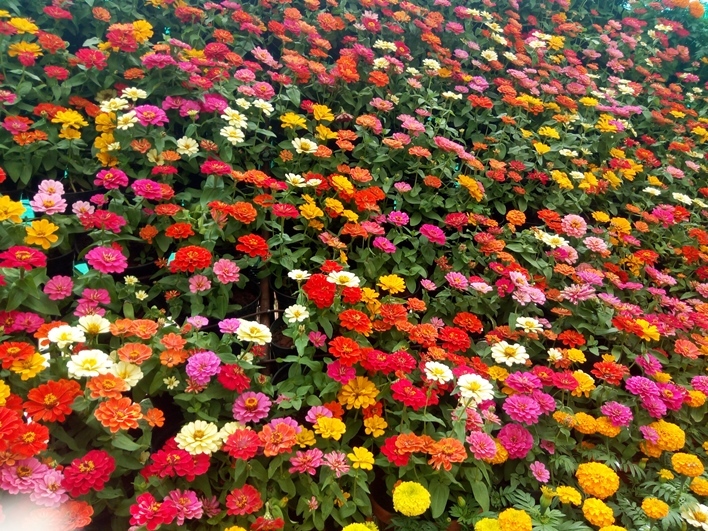 The event is jointly organized by the Department of Horticulture and Mysore Horticulture Society, this flower show has been one of the most awaited events in the Garden City. 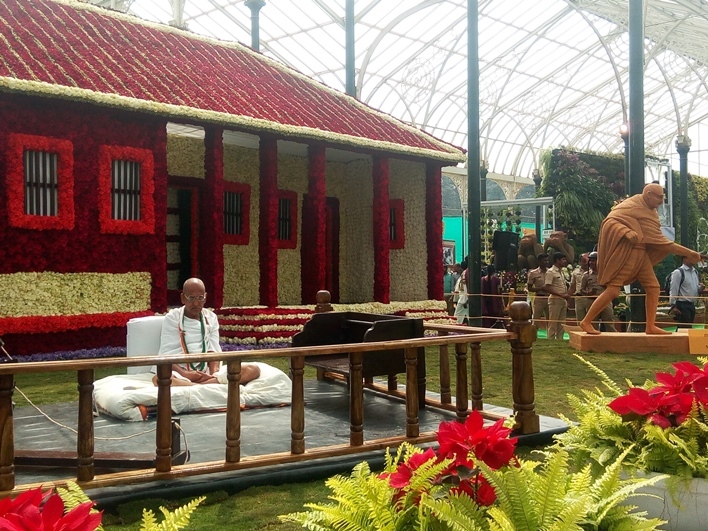 The 209th edition of the Lalbagh flower show begins on January 18, 2019, and is a tribute to Mahatma Gandhi. The show is a celebration of his 150th birth anniversary. The show will feature a 12-foot tall statue of a meditating Gandhi. The statue is crafted by Jithendra Bhavni, Karnataka Chitrakala Parishath principal. The ashram replica is built by 20 people in 15 days. The ashram replica is decorated with 2.4 lakhs of red roses, 80,000 orange roses and 3.2 lakh white chrysanthemums. 250 species of the orchids in 76 colors are displayed in the form of a pyramid. 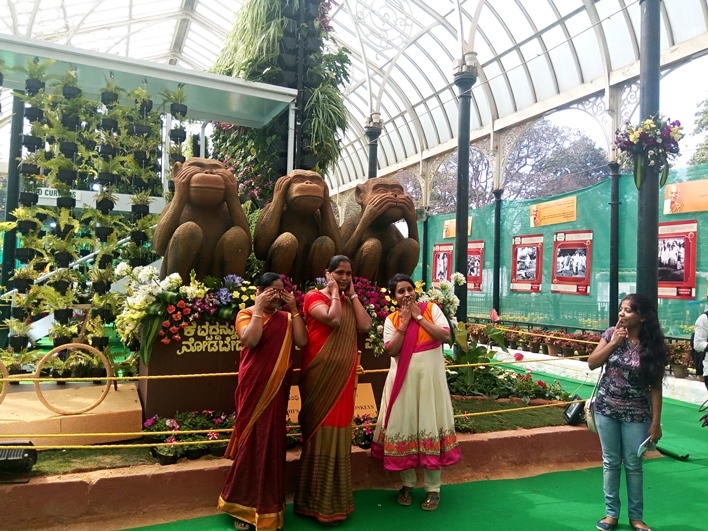 This edition of the Lalbagh Flower Show will be open to the public from the 18th to the 26th of January 2019. Over 7 lakh visitors are expected. The colorful flower arrangements and intricate models on display makes the exhibition attractive to adults and children. Plants and saplings will also be available for sale. Car parking will be at Shantinagar Bus Stand, the BBMP car park on JC Road, for two-wheelers at Al-Ameen College and HOPCOMS premises near Double Road Gate. Pedestrians can enter the flower show from any of the 4 gates. Entry fee for children on holidays/weekends is INR 20. You can buy the tickets for the show online. Entry of private vehicles has been banned into Lalbagh by The Horticulture Department. School buses are allowed into the garden through the Double Road gate. There are cloakrooms at each entrance of the Lalbagh Botanical Garden. 40 CCTVs, hidden cameras, and drone cameras have been used for providing security.